Hazek was arrested on December 2, 2013, just as his first novel was almost ready. Indeed, he had a 5 p.m. phone appointment with the owner of a print shop to discuss a few final details. But he was unable to make that appointment, as he was arrested just after 10 am. 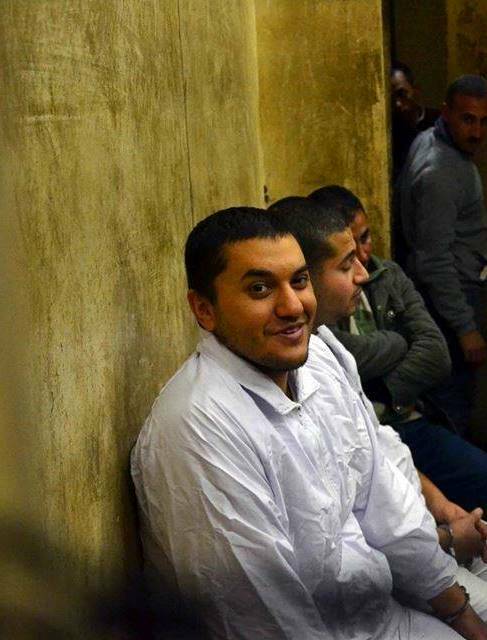 According to Ahram Online, there is no news concerning others sentenced in the same case as Hazek. They include the activist Mahinour El-Masry, winner of the 2014 Ludovic Trarieux Award for her contributions to the defense of human rights. It has been a long journey for Hazek. Back in 2009, he was a poet and librarian at the Bibliotheca Alexandrina. He’d published his first collection of poems, I Believe the Winter’s Sun, and, in May of that year, he travelled to San Giovanni, Italy with the encouragement of his employer. There, he attended the “Love, Justice, and Peace in the World” poetry festival and was given an award for his verse. Then, in the summer of 2010, Khaled Saeed died in police custody. This led to a movement, which helped organise the street protests of January and February of 2011. In the fall of 2013, Saeed’s family was still looking for justice. Although the government had recently passed a law restricting public protest, Hazek joined others outside the Alexandria Criminal Court in late November. That’s where the officers accused of killing Saeed were getting their retrial. The arrest also might have had political dimensions. The library’s Independent Workers’ Union said, in a recent public statement, that “it’s not too far-fetched” to believe that Hazek’s imprisonment is related to his outspoken attitude about corruption charges against Ismail Serageldin, who has been the library’s director since its opening in 2002. In any case, Hazek captured attention in Egypt and beyond with his moving letters from prison and the novels and poetry he continued to write in grim conditions. Also: Hugs to Omar, his sister Zahraa, and to his entire family. And if you are interested in English rights to his novels, or seeing excerpts, please let us know. Ahdaf Soueif puts it in a nutshell. It’s a political move. During the 60s many intellectuals were put in prison, released after a few years and given positions at the state’s cultural sector if they kept quite.